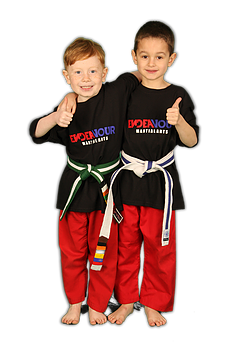 Martial arts is a fun way for both boys and girls to achieve fitness and focus. Some parents may think they also promote violence, but that’s a not true according to Master Greg Silva president of Black Belt Schools International. The martial arts actually help teach self-discipline and socialization skills. In fact, many parents whose children have attention-deficit/hyperactivity disorder (ADHD) report great success with these programs because self-control and concentration are exactly the skills underdeveloped in ADHD kids. A typical class begins and ends with respect by a bow to the teacher and parents. Next the kids have an affirmation pledging to have self discipline, a positive attitude, to use common sense before self defense and to never give up. After a warm-up, students practice the art’s particular skills, which may include kicks, punches and blocks. Each requires concentration and strict attention. Progress is marked by the belt system, which takes the beginner from a white belt through a variety of colors until black. Testing for each new level, generally every three months, is a good exercise in setting and achieving goals. Kids can benefit as young as age 4 with motor and social skills. As they get older there is a bigger emphasis on self defense and competition. Be sure to visit Endeavour and participate in a trial class to see the teachers in action and make sure it’s a fit for you and your child. Greg Silva – President Black Belt Schools International. I have been involved in the Martial Arts for 50 years now. I first began because my father wanted me to learn to defend myself. At that time I was in fight after a baseball game at age 13. In the following 50 years I was never in another self defense situation. 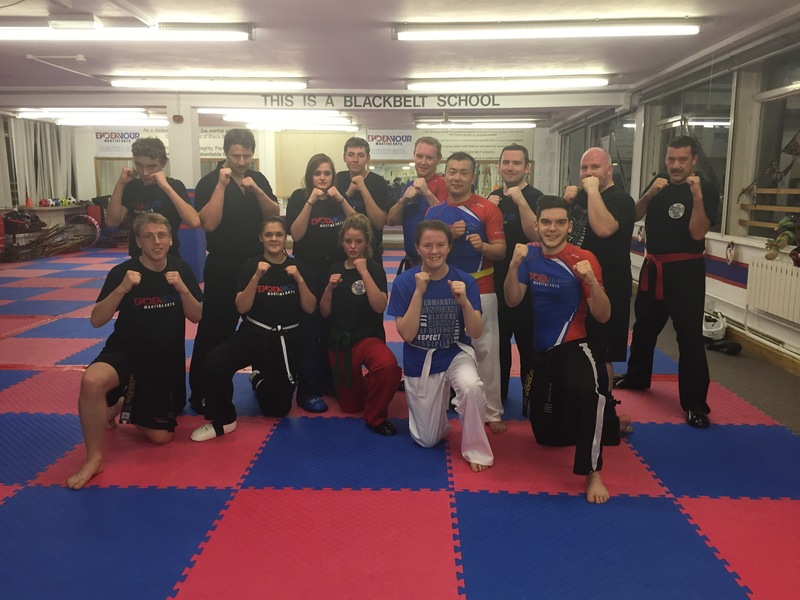 So why did I continue with martial arts? Simple, self defense is just one of many benefits of martial arts training. I happened to love the logic and analytical thinking involved in the training. I also know that martial arts has kept me more flexible , in shape and confident. Not to mention the friendships I made and the great spectrum of people I met and enjoyed training with and learning from. Now in my 60’s I find the same benefits and something extra. The focus, concentration, learning and memorization is keeping me mentally sharp. Try Before You “Buy”. Most martial arts schools will offer a Free trial program or short term mini program for new students. You want to make sure it’s a fit for you. *Talk To The Instructor – Most instructors are very accommodating to adults. Remember we are ones that write the checks, have kids who might attend the school and who have friends who might become members. So talk to the instructors if you have a problem or a question. *Ask For Help – If you are having a problem with a technique, ask for help. The instructors and other students want to help. They remember what it was like when they were “newbies”. *Lose Some Weight – If you are lighter, it will help to reduce the pressure on your knees & feet. You will also have more energy because you will be hauling around fewer pounds. This should be a first goal when starting. *Balance Training – As we become less active due to desk work, some of us become less steady on our feet. Martial Arts will teach balance with stance and foundation skills. A huge benefit for everything else you do. *Kids – If you have children, you should try to take martial arts classes with them. It is a great family bonding experience! *Have Fun – Last but not least, you should just focus on having some fun and blowing off steam after a long day at work. You won’t be as flexible as the kids in your martial arts class or as strong as the 25 year olds but who cares! Just enjoy yourself. You will love the camaraderie, weight loss, stress relief and non-stop aerobic exercise. *Take action and sign up for a Beginners Class Trial … Click below!